We’d love your help. Let us know what’s wrong with this preview of Judaisms by Aaron J Hahn Tapper. What does it mean to be a Jew in the twenty-first century? Exploring the multifaceted and intensely complicated characteristics of this age-old, ever-changing community, Judaisms examines how Jews are a culture, ethnicity, nation, nationality, race, religion, and more. With each chapter revolving around a single theme (Narratives, Sinais, Zions, Messiahs, Laws, Mysticisms, What does it mean to be a Jew in the twenty-first century? Exploring the multifaceted and intensely complicated characteristics of this age-old, ever-changing community, Judaisms examines how Jews are a culture, ethnicity, nation, nationality, race, religion, and more. With each chapter revolving around a single theme (Narratives, Sinais, Zions, Messiahs, Laws, Mysticisms, Cultures, Movements, Genocides, Powers, Borders, and Futures) this introductory textbook interrogates and broadens readers’ understandings of Jewish communities. 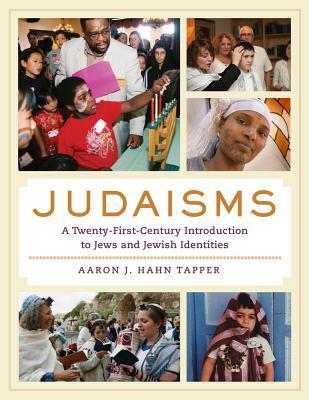 Written for a new mode of teaching—one that recognizes the core role that identity formation plays in our lives—this book weaves together alternative and marginalized voices to illustrate how Jews have always been in the process of reshaping their customs, practices, and beliefs. Judaisms is the first book to assess and summarize Jewish history from the time of the Hebrew Bible through today using multiple perspectives. To ask other readers questions about Judaisms, please sign up. This book delivers thorough research on what it means to be Jewish. This book delivers highlighted interpersonal experiences of the Jewish author. This book delivers by addressing tough topics within Jewish communities. Judaisms: A Twenty-First- Century Introduction to Jews and Jewish Identities by Aaron J. Hahn Tapper does not sway toward a single Jewish identity, but rather highlights the whole universal collective. I felt as high as a kite reading this one. R Engrossing! This book delivers thorough research on what it means to be Jewish. This book delivers highlighted interpersonal experiences of the Jewish author. This book delivers by addressing tough topics within Jewish communities. Judaisms: A Twenty-First- Century Introduction to Jews and Jewish Identities by Aaron J. Hahn Tapper does not sway toward a single Jewish identity, but rather highlights the whole universal collective. I felt as high as a kite reading this one. Right at a point of my life when I was hyper-curious about the Jewish identity, this book quenched the thirst of my intellect. Being entrusted with a copy of this book for an honest review was so unreal. I could reread this a million times and still not be filled. This jewel could easily be included among the texts given to students in Jewish 101, encompassing twelve chapters exploring topics fully capable of being stand-alone texts. The topics are diverse ranging from anti-semitism propaganda to cultural genocide, Jewish religious movements, zions and includes, but is not limited to postbiblical Messiahs. My favorite topic was the feature on Ashkenazi-ness and being white in the United States. Reading about Persian Jews, Jews among Muslims, Jews among Christians, and Jews in Asia all makes me feel more comfortable in my own skin. I have an Argentinean Jewish friend and for years we felt like unicorns. But skin color and ethnicity were never the only variations of our identity. There’s also culture, religion, and language. And yet there is no single understanding. This book explores the various variations from dominant to exotic closing loose ends of diversity to one merging of acceptance.